LMF II Infantry - Black. Back by popular demand and successor to the LMF, the Gerber LMF II has features worth noting. The 4.84 stainless steel blade is partially serrated and easily cuts through straps and belts. On the end of the knife is a flat spot strong enough to drive a nail and a point rigid enough to shatter plexiglass. The shape of the handle allows the knife tie onto the end of a shaft thus converting it to a spear. Inside the hard plastic sheath is an integrated sharpener. 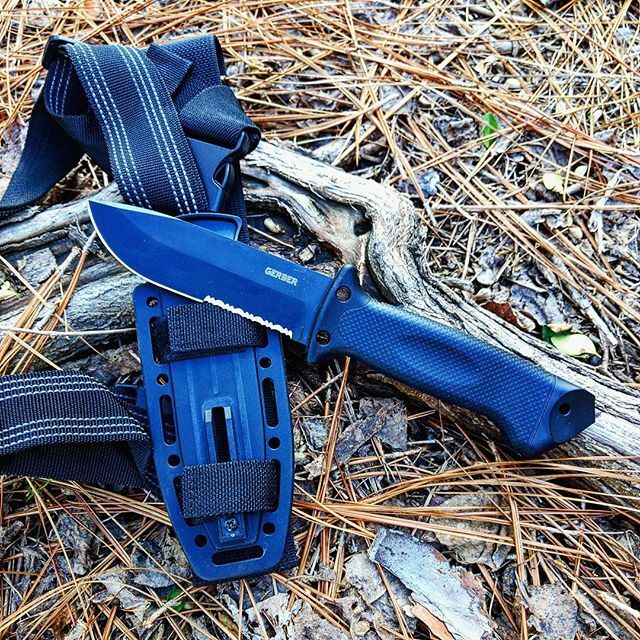 The sheath can be easily adapted to mount the knife on your belt, arm, leg, or jacket. Comes with the kydex stheat that has two leg straps. Lanyard hole on the end. The LMF II is ready to help you with surviving!